as the flagship, as the ultimate, four wheel drive luxury vehicle. This is the most advanced, most powerful, most complete luxury wedding transport in its class. 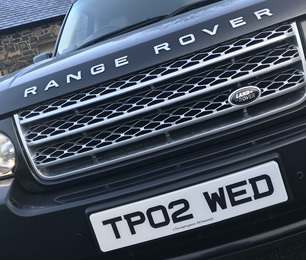 The Range Rover will allow you to travel in complete comfort and safety in all weathers, winter and summer with climate control and heated seats if required. It makes a modern elegant statement to your wedding guests and can compliment our jaguar or Chrysler. The gleaming black exterior is always the perfect colour for the wedding photos, highlighting the bride. Inside it is finished to the highest standards including cream leather to make your journey luxurious and enjoyable.